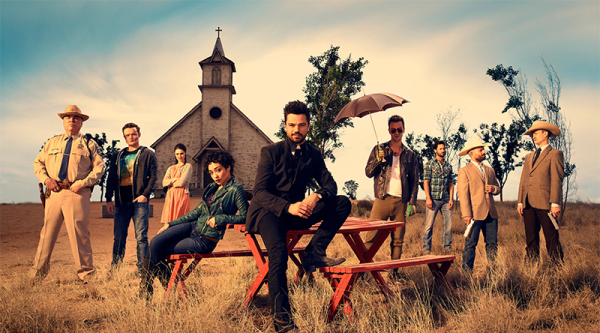 Opening odd foreshadowing weirdness to remind us of the weirdness that is just Preacher: a man ominously buying some white powder extracted from poor, desperate people for a moderate sum of money - and then sold to very rich, desperate people who pay much larger sums of money to use it to cure alzheimers. Ominous -and yes there are comments to make about class and exploitation - but, c’mon, it’s not exactly subtle or require a nuanced examination. Well, their neighbour’s door anyway. The Saint of Killers works his way through them one at a time with gun and knife - one of his bullets making it’s way to Dennis’s fridge and alerting Jessie that there’s something going on - they run. Not by god anyway. But Jessie has sent someone to hell with the word, Heaven can’t be that much different. But there’s one missing piece - he needs a soul. The Saint of Killers, his mythology says, is the one man in Earth without a soul. The Saint agrees to give Jessie a chance - and one hour to get him a soul. And he’s holding Jessie, Tulip and Dennis captive until Jessie gets back. Which is the expertise he puts to work checking on New Orleans soul sellers - of which there are a few. Or were a few - it seems they’ve all been put out of business by the Japanese new business who have modern technology and are using portions of souls. And yes this comes with a whole lot of pretty gross stereotypes. Jessie tries to break into the armoured van they use to store their souls but even Tulip’s home made bomb doesn’t make it work. Instead he has to resort to the police and the Word. Clearly torn as a religious man, Jessie asks what the smallest amount of soul they can extract - 1%. This seems to be enough because he manages to get to the Saint just before he kills Tulip (Cassidy losing all the fingers on his hand trying to hold back his sword) and give the Saint his soul. But the plan to send him to hell like he did Eugene? Well… the Saint technically has a slither of Jessie’s soul now. Ooops, didn’t think that through..
Plan B is to dump the Saint in an armour car and the bottom of a pond (or bayou or swamp or whatever they have near New Orleans). I wonder how permanent that will be. Methinks the Saint of Killers is not so easily restrained or having a piece of his soul missing will really be so harmless. Everyone is reunited, healed and ok again - including Dennis and Cassidy. Everything seems happy - but Tulip is still visibly shaken. And Jessie hides something under Dennis’s bathroom floor.